« Right Torah, Wrong Torah! Well, what about all those other verses that seemingly show the opposite is true and that there were some people in Scriptures that never experienced death like Enoch and Elijah? Could it be that they were able to take a shortcut to paradise? Our attention is first drawn to the statement from Genesis 5:24, “And Enoch walked with eloahim, and he was not (found), for eloahim took him.” The phrase, “And Enoch walked with eloahim,” is taken by some to mean that Enoch was walking with eloahim in heaven. The first problem is that Enoch is specifically said to have been walking with eloahim for 300 years prior to eloahim taking him (Gen. 5:22-23). The inconsistency is therefore manifest that they would have him walking in heaven before he was taken to heaven. The Greek Septuagint version renders this word oume heurisko, meaning, “was not found.” Therefore all that it says is that the men who sought his life could not find him. Then what is the true meaning behind the statements in Genesis 5:24 and Hebrews 11:5? The key to these two passages lies in the ancient extra-biblical book of Jubilees, which states that eloahim took Enoch from the children of men after he had testified against both the sinning angels and men regarding their evil. The evidence from Jubilees is clear. Enoch was taken from among men and placed in the garden of Eden, one of the four places ON THE EARTH sanctified by Yahweh. It was not to heaven that Enoch traveled, but to Eden. The wicked men who sought Enoch’s life because of his testimony were unable to find him, in part because mankind had been banished to the land east of Eden after Adam and Eve had sinned. What the “Rapture Advocates” have failed to read is the clarification given at the end of the commentary in Hebrews. During the discussion from Hebrews 11:1-6, the author tells us about several people in the ancient world who trusted in Yahweh: namely Abel, ENOCH, Noah, Abraham, and Sarah. Accordingly, Enoch died, just as Abel, Noah, Abraham, and Sarah did, never having received the promise of eternal life. Reminiscent of Enoch’s disappearance, men afterward were sent to look for Elijah but were unable to find him (2 Kings 2:12-17). This story is understood by many to mean that Elijah, like Enoch, did not die but ascended up into the third heavens where father Yahweh resides. In this piece of scriptural history, those believing in a shortcut to heaven feel they have found their primary article of proof. It is certainly true that in this scripture we are told that Elijah “went up in a whirlwind into the heavens.” However, Elijah had not died, he went up bodily. What heavens, then, did Elijah go up into? This detail is explained not only by the facts surrounding Elijah’s departure but in the story of the subsequent events. Now’s the time to pay close attention to the following five points of chronology. 1. Elijah’s departure took place shortly after the death of Ahaziah, the son of Ahab, king of Israel, who ruled but two years, beginning in the seventeenth year of the sole reign of Jehoshaphat, king of Judah (1 Kings 22:51-52; 2 Kings 3:1). Therefore, Elijah ascended into the heavens at the beginning of the reign of Jehoram, the son of Ahab and brother of Ahaziah, the king of Israel who succeeded Ahaziah in 847/846 B.C.E., spring to spring reckoning. 2. The following from 2 Kings confirms point 1. Jehoram, the king of Israel, began to reign in the eighteenth year of the sole reign of Jehoshaphat, the king of Judah (847/846 B.C.E.). He ruled for 12 years (2 Kings 3:1). The date of Elijah’s ascension, therefore, is in the year 847/846 B.C.E., spring reckoning, at the time that King Jehoram became king. 3. Elisha, who succeeded Elijah as prophet, after Elijah’s ascension, went to Jehoram, the king of Israel, just after he took his throne. At this time Jehoram was allied with Jehoshaphat in a war against the nation of Edom (2 Kings 3:1-27). This detail shows that Jehoshaphat was still alive after Elijah’s ascension. 4. In the fifth year of Jehoram the king of Israel (843/842 B.C.E. ), Jehoram, the son of Jehoshaphat, became the king of Judah while Jehoshaphat was still alive (2 Kings 8:16-17; 2 Chron. 21:5,20). 5. AFTER the death of Jehoshaphat, the prophet Elijah WRITES A LETTER to Jehoram, the king of Judah, foretelling him of his impending death! Two years later, Jehoram, the king of Judah did in fact die, having had a sole reign of eight years (2 Chron. 21:1-20). Jehoram died in 836/835 B.C.E. Accordingly, Elijah’s letter must have been written in about 838 B.C.E., shortly before Jehoram’s death and some 9 or so years after Elijah’s ascension in 847/846 B.C.E. Our answer lies in the book of Jewish Antiquities written by the Jewish priest Josephus during the first century C.E. Josephus gives the same sequence of events as reported in the Scriptures (Jos. Antiq. 9:2:1-9:5:3). Elijah never went beyond the first heavens. He merely “went up in a whirlwind into the heavens,” meaning our immediate atmosphere. The heavenly realm he proceeded through was the same one in which birds fly. The angels (eloahim) that took him up simply placed him back upon the earth, where he remained, like Enoch before him, concealed from the people. Elijah and Enoch, therefore, both became “viewless,” or “unseen,” that is, they were hidden from view. Yet, both were still on the earth. The fact that “no one knows of their (Elijah and Enoch’s) death” or of Elijah’s “end” does not mean that they did not die, only that no man was around to witness or record it. The evidence demonstrates that Elijah and Enoch never went beyond the first level of heavens, the atmosphere surrounding the earth. Elijah and Enoch, like every other man born of flesh, were incapable of entering into the third realm of heavens. In accordance with the words of Yahushua and the Scriptures, no man has ascended into the third heavens where father Yahweh resides, and this includes men like Enoch and Elijah. In both cases, Enoch and Elijah, after being taken up from the earth by eloahim, were carried through the first heavens and then once again placed upon the earth. Like all men, except for Yahushua the messiah, Enoch and Elijah died on the earth. We’re actually not finished with this subject yet. 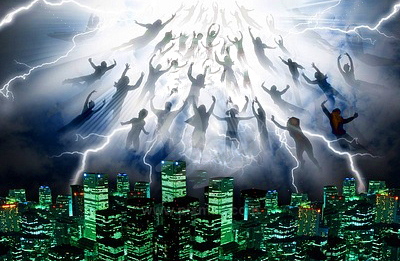 We will continue with the so-called New Testament “Rapture” proofs in our next post titled Rapture Redux. This entry was posted on 06/04/2012, 4:45 pm and is filed under Grace, Heaven, Hell, Immortal Soul, Judgment Day, Religion, Resurrection, Salvation, The Rapture, Yahushua, Yahweh. You can follow any responses to this entry through RSS 2.0. You can leave a response, or trackback from your own site.